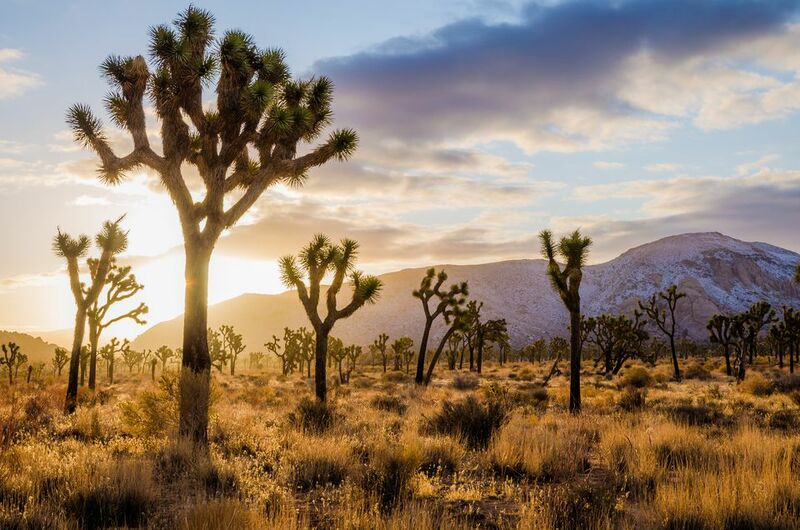 Joshua Tree National Park encompasses more than 500,000 acres of California desert. It's a starkly beautiful landscape, filled with otherworldly Joshua "trees," which aren't trees at all, but tree-like members of the yucca family. Several earthquake faults (including the San Andreas) criss-cross the park. Their action forces water to the surface and creating oases that support the native desert fan palm. The park is one of California's most beautiful—and less-visited—natural treasures, with lots of plants and animals, striking rock-strewn landscape, and places to hike, climb rocks, take photographs, or just get away from it all. It will take you at least a few hours to get a quick look at Joshua Tree, not counting the time it takes you to drive there. Weather: Spring and fall have the best weather when highs run about 85°F and lows around 50°F. Summer can be scorching with high of more than 100°F, and it won't get much below 75°F at night. Winter days reach 60°F (15°C) with freezing nights. It occasionally snows at higher elevations. Temperature changes: Elevation changes within the park cause temperature differences of 10°F or more. Palm Springs may be as much as 15 to 20°F hotter than Keys View. Watch your step: Those sturdy-looking desert plants grow in fragile soil, which contains micro-organisms that hold the sand in place and nourish the plants. Even one step kills the organisms and ultimately, the plants. Give the fragile environment a break and keep your big feet on the trails. Bring it with you: There are no concessions inside the park. Bring food and water with you. For a campfire, bring your own wood—and burn it only in designated spots. Going off-road: Four-wheel-drive vehicles and mountain bikes can get to more places than a family sedan, but they still have to stay on the road. ATVs and off-road vehicles are prohibited. Be wary of tours from Palm Springs to Joshua Tree: Some may only take you into a small portion of the park and not give a full tour of it. Ask lots of questions before you commit to something that might disappoint you. No matter what you want to do, start at one of the park's three visitor centers. Consult a ranger there to help figure out the best things to do for your interest and abilities and to find out about current conditions. Joshua Tree's granite rock formations make it popular with climbers and bouldering enthusiasts from around the world. In all, the park has more than 400 climbing formations and 8,000 climbing routes suitable for all levels of ability. If you want to try climbing in Joshua Tree, be sure you know all the rules and regulations and engage a local guide if you're new to the activity. Local outdoor stores sell climbing guides and are also a good place to get practical information. You can also buy the guides at any park visitor center. Be sure you not only know what you're doing but where you can do it. Park rangers give guided tours of a former working ranch, telling the colorful story of the 60 years Bill and Frances spent working together to make a living and raise their five children in this remote location. Tickets are required. You have to buy them in person on the day of the tour at the Oasis Visitor Center in Twentynine Palms. 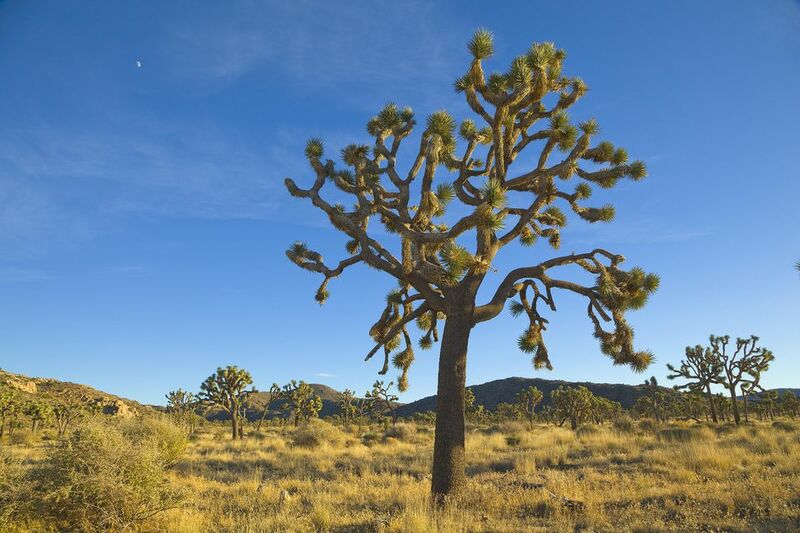 Joshua Tree has 12 nature walks and hiking trails for every level of ability. Wildflower watching: Spring bloom depends on rainfall and temperatures, but in general, you'll find things blooming between February and April, lingering in the higher elevations through June. Birdwatching: Spring brings feathery visitors to join those who live here year-round, such as cactus wrens, roadrunners, and Gambel's quail. The visitor center has a checklist which will detail species most likely to be sighted during your visit. It doesn't happen every year, but sometimes in the spring, 200 or more turkey vultures roost at the Oasis of Mara. Away from the city's light pollution, you can see more stars than you may have known existed. To learn about them, attend a "star party," held on Saturday nights close to the new moon. The 1.5-hour programs begin shortly after dark. You can see a lot on a drive through Joshua Tree. Our recommended driving tour, below, is fun to look through, even if you can't go there to see the place in person. The route starts on the south side of the park at the Cottonwood Spring Visitor Center and exits through the town of Joshua Tree. It will take at least 4 hours to see the park on a leisurely drive, stopping only for short walks and taking photographs. Bring food and water because you won't find them in the park. Allow more time if you want to take longer hikes. It's also possible to take this drive in the opposite direction, but entering from the south allows a gradual climb from the Colorado Desert into the Mojave and ends among the spectacular granite boulders and Joshua trees the park is famous for. Start at the south entrance to Joshua Tree. You can get there by exiting I-10 at Exit 168 (Cottonwood Springs Road). Cottonwood Spring is near the Visitor Center, one of the several palm-lined oases in the park. A short walk from the parking lot leads to the oasis, where you'll find a remnant from the area's brief gold rush, a stone mill used to crush ore. A 2.4-mile loop trail leads to the old Mastodon gold mine or if you've got time and energy for a 7.6-mile, moderately strenuous hike, you can visit one of the park's largest oases, Lost Palms. The palms you see here are California fan palms, the only palm native to California. Any time you see them in a cluster like this, you can guess that water is nearby. You may also notice that the palms are still wearing their "skirts," the still-attached, dead leaves that are usually removed when the palms are in an urban setting. Continuing through Joshua Tree on Pinto Basin Road, you'll come to the Ocotillo Patch. The ocotillo plant looks quite forbidding and dead in December, but in spring it sprouts small, oval-shaped leaves and exuberant red flowers pop out of the ends of each branch. Entering Joshua Tree from the south, you start in the Colorado Desert, its floor as much as 275 feet below sea level. Ocotillo is one of the typical plants of the Colorado Desert here. Others include creosote bush, paloverde (bush-like plant with green bark), and cholla cactus. Shortly past the Ocotillo Patch is the Cholla Cactus Garden. One of the most striking stands of vegetation in all of Joshua Tree, the Cholla Garden is so spectacular that you'll want to stop the minute you first see it. Keep going to the parking area, and you can take a walk among the spiny plants, some of them more than 5 feet tall. The form of cholla which grows here goes by the nickname "teddy bear" because it looks furry from a distance. Other people call it jumping cholla because it almost seems to jump out and grab you. In fact, the spines bear a fish-hook-shaped end which allows them to latch on easily and the sections are easily detached - all of that making it very easy for it to hitch a ride. To get the most out of the cholla garden, pick up the self-guided brochure (leaving a donation in appreciation) and learn about not only the cacti and why their stems are black, but also about the animals who manage to make their homes in this seemingly inhospitable place. Another inhabitant of the Cholla Garden is the Pencil Cholla, its branches covered with diamond-shaped plates with a long spine emerging from each one. As bad as those long, sword-like spines look, the worst of the pencil cholla is at their base in the tuft of tiny spines called glochids, which are so small that you can barely see them, making them even harder to remove from your skin than the big, barbed ones. At Jumbo Rocks, you won't spend much time wondering about how the place got its name. The rocks are truly jumbo-sized. The darker-colored rocks are called Pinto gneiss (pronounced "nice"), and the lighter ones are granite. They've been hanging around together for about 85 million years, ever since they met deep inside the earth when molten magma forced its way into the gneiss and crystallized. The edge of the ancient magma chamber is still evident in the "contact zone" between the two types of rocks. The "tree" this national park is named for isn't really a tree at all. Instead, it's a member of the lily family whose official name is Yucca brevifolia. It's also an indicator that you are in the Mojave desert, which occupies higher elevations than the Colorado Desert around Palm Springs. When you see a large specimen like this one, it's easy to see how it got the "tree" moniker. The tallest ones grow to 40 feet high (at the rate of about 1/2 inch per year). The Joshua part came from the biblical figure, named by early Mormon immigrants who—as legend tells it—thought the tree's outstretched limbs guided them westward like Joshua guided the Israelites to their promised land. In a wet year, Joshua tree branches sprout clusters of white-green flowers, making them an even more extraordinary sight. It's easy to see how this unusual rock formation near Jumbo Rocks got its name, with the two hollow eyes. It's only one of the many unusual granite formations you'll find in Joshua Tree, weathered into fantastic, rounded shapes and making a great place for rock climbers to enjoy their sport. A lone Joshua Tree is a startling enough sight, but a whole forest of them brings to mind a Dr. Seuss drawing or a Tim Burton film. This little pseudo-forest is near Skull Rock. It's a short side trip to Keys View on Keys View Road and you can't get lost. The road ends at the vista point. Go back to Park Blvd and turn left to continue. At 5,185 feet elevation, Keys View offers a panoramic view of the Colorado Desert, Coachella Valley, and San Gorgonio Pass. The short side trip down a paved road is well worth your time. It might be in a desert, but Joshua Tree is far from dead. You won't find any big animals because they need too much water, but you can find 52 species of mammals, more than 40 kinds of reptiles, tarantulas, scorpions, more than 75 butterfly species, and even frogs and toads. And all of that doesn't include the more than 250 bird species that have been spotted in the park. Among the most interesting critters is the round-tailed ground squirrel which hibernates in the summer and in the winter and the kangaroo rat, which can manufacture its own water by digesting dry seeds. Golden eagles hunt in the park regularly. You may also see a roadrunner—they are a real bird and not just a cartoon. And a couple of amphibians have adapted to the dry climate: The California tree frog and the red-spotted toad. Joshua Tree has nine campgrounds with almost 500 campsites. You'll find RV-compatible spaces and dump stations, but no hookups. Some campsites are on a first-come, first served basis, but others can be reserved from September through the end of May. Call 877-444-6777 up to six months in advance or make reservations online. If you get there and find the park campgrounds full, the Bureau of Land Management operates a couple of camping areas nearby. If you'd rather stay in a hotel, you can find plenty of places to stay in Palm Springs. You might also like Hicksville Trailer Palace, a collection of travel trailers surrounding a swimming pool or Kate's Lazy Desert Airstream Hotel, a place where the trailer have names like Tiki, Hairstream, and Hot Lava that finds a place on many bucket lists. Joshua Tree National Park is open 365 days a year. Admission is charged, except on a few free admission days that vary by year. Joshua Tree National Park is in Twentynine Palms, California. It's east of I-10 near Palm Springs, 140 miles east of Los Angeles, 175 miles northeast of San Diego, and 215 miles southwest of Las Vegas. Within the park, the roads are all connected. Not too far from Joshua Tree south of Palm Springs is the Salton Sea, a body of water that shouldn't have existed—except for an accident. Further south, you'll find the Anza-Borrego Desert and north of Joshua Tree is ​Death Valley.